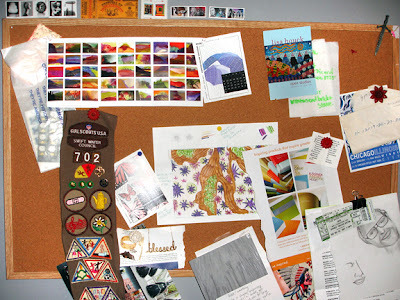 Last year, when I first redesigned my studio, I didn't put up my bulletin board. Instead I painted one HUGE wall with chalkboard and this is where I was going to write all my notes. This worked for about 2 days before I felt a huge void, where was I going to post all my inspiration pieces? So I took down some artwork and up went my bulletin board. I loved Jessica's previous post, seeing what things are on her board so I thought I would share mine. I always rotate things on the board, sometimes going through the layers can be the equivalent of a small archaeological dig. So... What is on YOUR inspiration wall? Cool, the girl scout sash really inspired me. I am a leader and need to get to my mom's house and scout out mine!